Posted on April 11, 2013 | 8465 views | Topic : Featured, Investment. Teoh: Five proposed highways are George Town Outer Bypass, The North Coast Pair Road, The Air Itam – Relau Pair Road, The North-South Expressway Link Road and the Third Sea Crossing. Hot spots include Batu Maung, Bayan Lepas, George Town, Tanjung Bungah, Teluk Bahang, as well as areas around five new proposed highways. 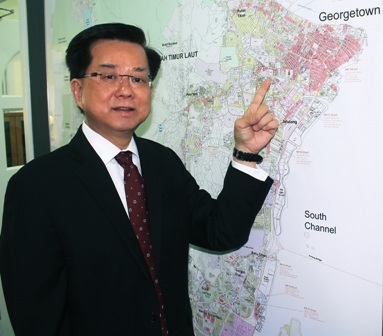 “Despite uncertainties in both external global economy and internal political risks that have caused some investors to slow down in the short term, market analysts believe that the cautiously optimistic trend will continue in 2013 with a stable and positive outlook (in medium to long term) for Penang’s property market, sustained by healthy core demand, manageable mortgage rates, and positive economic growth,” says Henry Butcher Malaysia (Penang) director Jason Teoh, interviewed in conjuction with the upcoming Malaysian Secondary Property Exhibition (Maspex) 2013. “On the island, the hot spot or corridor of opportunities would be in Batu Maung, Bayan Lepas, George Town, Tanjung Bungah and Teluk Bahang areas. On the mainland, the investors would be able to get residential properties that are relatively cheap with low density at strategic locations. A new enabler – the second Penang Bridge, will appear in the landscape of Penang soon in the third quarter of this year. The opportunities may arise not only on the island but on the mainland as well. Investors perhaps could look into and analyse the future potential opportunities of the land banks around the intersection of the North-South Highway and the second Penang Bridge,” Teoh advised. Of all property types, terraced houses have increased in price the most over the last few years. Its price index from 1999 to Q3 2012 (P) can be seen in the graph above to have hiked higher than other type of properties. Another type of property that is in hot demand, with potential capital appreciation, is pre-war heritage shophouses. The price index of pre-war properties in George Town started to soar after 1999 (chart below). Teoh believes that the demand for properties in both the new and secondary market will continue to grow and appeal to a wider segment of local and international buyers. Henry Butcher Malaysia (Penang) has been providing real estate solutions to government, commerce and industry in Malaysia for more than 20 years, says Teoh. It calls itself a “one-stop” provider, offering a comprehensive range of services. Maspex 2013 will be held over the weekend of April 12 to 14, at the concourse of Tropicana City Mall, PJ. Organised by the Malaysian Institute of Estate Agents (MIEA), it will feature booths by 32 real estate agencies with photos and presentations of previously owned properties for sale. Other participating agencies include Reapfield Shah Alam which talks to StarProperty.my about Shah Alam hot spots, as well as Property Hub Sdn Bhd which talks to us about how many buyers are anticipating a price correction.